PLAY SCULPT LIVE: Gingham Glory! Ironcraft threw out the challenge of the letter "G". I immediately went for gingham. I love that pattern and fabric. I owned a pair of stretch turquoise and white gingham pants and I loved them to death. Literally, I wore them until the fabric just let go. I thought I looked so smart in them. 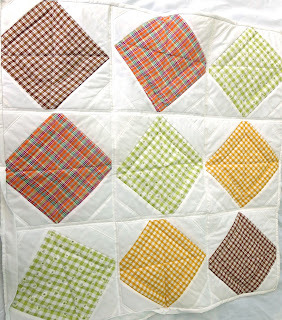 I chose some gingham fabrics from my stash and put a couple of goals into the same project. I had a book that teaches 'quilt-as-you-go' techniques and I decided to make a center piece for my kitchen table from the gingham fabrics I found using the techniques in the book. My kitchen is mustard with white trim and my fabrics look awesome in there. As always I learn many lessons during these challenges. Mostly I learned that try as I might, I am not very good at getting the same results described in the books. I was to have blocks that measured 12". I needed 9 of them. I followed the steps and still, none of my blocks ended up to be the right size. I squared them all off to 11" in the end. For this project, it isn't the end of the world and I've come to the conclusion that if I'm using this technique I will be better off starting with a larger block to I can square it off to the desired size. This technique, though, does permit me to make a larger finished quilt than the regular way. I also like the look of the piecing of the blocks. I'm going to stick to this technique for a while I think. Of course, the next book might teach me something else I will equally like. At least I hope so. It's always nice to learn new things and to accept new challenges. Keeps the brain and the spirit young. I'd love to hear what you do to keep your brain and spirit young? What challenges you like to set for yourself? I've struggled getting the right size pieces in quilting too. I'm just not exact enough I think! I think I share that too, Kat. I guess practice makes that better but it sure is frustrating.